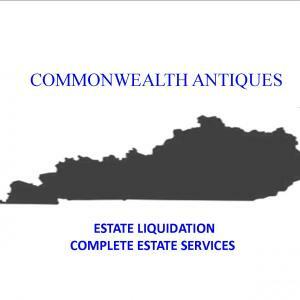 Commonwealth Estate Sales offers a professional personal property liquidation service, specializing in on-site estate liquidation sales throughout the Eastern and southern US. area for complete households and businesses, urban and rural, including antiques, household furnishings, boats, vehicles, equipment, etc. Our family owned estate sales and liquidation company has more than twenty years of experience and is made up of knowledgeable and seasoned professionals, as well as hardworking independent contractor labor. Our estate sale company will come into your home to clean, sort, stage, appraise, price, market and sell your entire content in just one week. We will empty the entire estate: House, garage, yard and if requested, leave your place neat and clean for marketing or inhabitancy within a week of signing a contract. Let our estate sales and liquidation company turn your family inheritance or parent’s estate into quick cash for you and your loved ones. We can help you get the most money for your antiques, collectibles and home furnishings in the least amount of time. We have the largest e-mail (over 6,000 followers and counting) and mailing list of dealers and customers from Kentucky and New York .and all southern states.. We bring with us a solid reputation for giving a clean, organized and complete estate sale within a short amount of time, allowing you and yours to finally have time to relax and forget about your worries. What do you need to do before you hire us for an estate sale? Absolutely nothing. In addition to that, we are in hope that you and your family will leave everything just where it is. Don’t clean, sort, or throw anything away. Merely remove any family heirlooms or photos that you would like to keep for you and your loved ones, and leave the rest to us. We are here to make your life easier and the biggest favor you can do for us is to let us decide what to recycle, re-purpose, throw away and what to sell. You’d be amazed at what we will be able to market. Now relax and let the estate sale and liquidation experts take charge. I’m going to walk you through the estate liquidation process that we deal with everyday in situations such as yours. Hopefully, this will leave you feeling more knowledgeable and relaxed about what it is that you are about to go through. Panic and worry seem to melt away once you are informed and well read about the procedures that we liquidators go through to ready your home and personal items for complete liquidation prior to emptying your home for you. To begin with, Larry and or crew members will visit your home or the residence in question. We will walk through and do a thorough review of the contents and reach a decision as to whether or not to proceed with an estate sale. Should your contents not be enough for a sale, we will help you with a small sale you can do. If its not worth the time we will put you in contact with a reputable and caring local charity which will best suit your needs, where your families belongings can be best used and appreciated by those who have little or nothing of their own. In the case of the home having well enough content to actually proceed with a sale, now is the time for us to agree on a commission and negotiate the contract, and sign such to begin our work in order to liquidate your estate. We don’t like to waste either of our time in beating around the bush to decide when and where; it is best that you are ready when you call us to interview our company, so that you can make an informed decision on who will best fit your needs. We like that you choose us with an open and educated mind and that you will always be happy with the finished product, and that you did in fact make the right decision. After setting a date for the sale to be held (at least seven to ten days after contract signatures) we will ask to have a key and full run of the home to work in day or night, depending on how much there is to do. We will then begin to unearth, clean, sort, photograph, research, and market your items for sale. Now comes the time for the sale once everything is in order and looking it’s best. In order to make the sale the best it can be, we ask that nothing be removed from the sale after our crew comes to work on the house, save personal items which we have set aside for your family, any monies found, fine jewelry we will ask if you would like to keep, as well as coin collections and guns or extremely valuable family heirlooms. We don’t want anyone to regret selling something that was part of their family and they are unable to replace. We want the end result to be a happy and contented one, never one of worry. Our goal is three fold; to make this process as painless as possible; allowing us to do the hard word and show respect for the memory of the deceased, to enable our clients to find magnificent items to add to their collection at a fair and decent price, and in the end to make a living from a business we love being a part of in every way. With these things in mind, we do our best to please all of the people we deal with, while holding tight to our integrity and following our hearts with the knowledge that we are doing the best job we are able and earning a track record we can be proud of. We are very concerned about your satisfaction. We will do everything in our power to make this as painless as possible and as good of an experience as can be. We want you to be so happy that in the end you will write us a testimonial to use on our site for future visitors to read and learn from. For more information or to meet in person, please call us at 859-559-5586. Or Email MilburnLexington@aol.com Once more we remind you that our assessment of your property and your family’s estate is absolutely free of charge and will only cost you your time. We look forward to helping you. Baldwin piano. Glassware. Very nice furniture and so much more. very nice estate sale furniture, tools, jewelry, toys and so much more..
huge estate sale many great items. Books, glassware, furniture, computer items, linens, amazing dining room set and so much more. This company has posted a total of 97 estate sales. Only the most recent 50 sales are shown.